There are Virtually No Signs of A Slowdown Anywhere in Asia! There are exceptions, such as Thailand where there's a domestic political crisis. But by and large, it looks like full speed ahead here in Asia. Kuala Lumpur, Hong Kong, Macau, and Shanghai are all booming with just as much fervor as they were last year. The only noticeable difference I see: Asian domestic consumption is on the rise big time! Consumers in these countries are now going wild with their accumulated savings and new wealth. Property prices are booming. And sales of durable goods, like refrigerators, air conditioners, and cars, are soaring. A record six million LCD televisions were sold in Asia last year. And 2007 sales are expected to jump to 11 million , a whopping 83% increase! Asia's PC sales jumped 11% in 2006, with laptop sales surging 33%! Carrefour, a hypermarket operator, saw revenues jump 14% in its Asian retail operations, contributing to a near doubling of the company's net earnings. China's overall retail sales jumped nearly 15% in February, the fastest pace in two years! Sales of household appliances soared 22% … clothing sales rose 28% … sales of meats and eggs jumped 33%! I think this is just the beginning of a new phase of economic growth in Asia. China will lead the way forward, taking huge steps to ensure continued growth. The trends will fan out from the urban areas to the countryside. 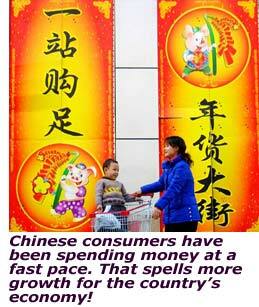 And domestic consumption will rise across the entire Asian region. In this scenario, Asian currencies will continue to strengthen, corporate profits will rise, and Asian stocks should surge higher. Naturally there will be speed bumps along the way, but I think Asian economies and stock markets will outperform those in the U.S. and Europe for several more years. I don't normally get this detailed in Money & Markets , but once in a while I like to highlight some specific companies just to give you a sense of what's out there. I'm a big fan of natural resources and companies that provide real value, real assets, and real wealth, so those are the kinds of stocks I want to talk about today. What's more, all of these stocks are tied to the basic fundamental forces driving Asian economies higher. I'm talking about the fact that three billion people, nearly half the world's population, are leap-frogging from the 19 th Century straight into the 21 st Century. My Real Wealth Report subscribers already own a number of these stocks. Naturally, I reserve all the specific order details (how much to buy, when to buy, when to sell, etc.) for them. #1. Sinopec Shanghai (SHI): Officially known as Sinopec Shanghai Petrochemical, this company makes more than 60 products out of hydrocarbons, including refined oil products, petrochemicals, plastics and resins, and synthetic fibers. #2. 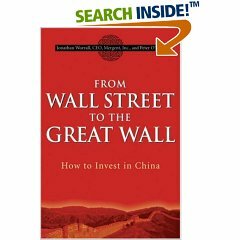 PetroChina Co. Ltd. (PTR): This is China's main oil and gas company. A subsidiary of state-owned China National Petroleum Corporation, PetroChina produces two-thirds of China's oil and gas. The company has proven reserves of 11.5 billion barrels of oil and 48.1 trillion cubic feet of natural gas. It operates 25 refineries, 12 chemical plants, and 15,900 gas stations. #3. CNOOC Ltd. (CEO): Yet another Chinese oil and gas giant, this company is targeting 2007 oil production of about 170 million barrels of oil. Plus, it's got five new oil projects expected to come online this year. #4. Santos Limited (STOSY): An Australia-based company that focuses on exploring, developing, producing, transporting, and marketing hydrocarbon resources. This one is down a bit since I mentioned it in June, but I have faith in the company's long-term prospects. #5. China Petroleum and Chemical Corp. (SNP): The latest news on this firm is that it just discovered a new major gas field in China's southwest Sichuan province. Sounds promising! #6. Alumina Limited (AWC): This Australia-based company owns 40% of Alcoa World Alumina & Chemicals, the world's largest alumina business. In my view, it's a possible takeover target. #7. Aluminum Corp. of China Ltd. (ACH): Nicknamed Chalco, this company is China's leading aluminum producer. And let me tell you, China is gobbling up that metal like crazy. The company's earnings were up 67% in 2006! #8. Posco (PKX): This Korean company is the world's third-largest steel maker. Warren Buffett recently reported that he's been investing in this company. Talk about an endorsement! #9. Amcor Ltd. (AMCR): Based in Victoria, Australia, Amcor makes and markets corrugated boxes, cartons, aluminum and steel cans, flexible plastic packaging, plastic bottles and jars, and more. The company operates 240 manufacturing plants in 39 countries. #10. Kubota Corp. (KUB): This Japanese firm manufactures farm equipment, engines, pipe and fluid systems engineering, industrial castings, environmental control plants, and housing materials and equipment. Revenues over the last nine months rose 9.6% from the same period a year earlier, while operating income gained 12%. #11. Korea Electric Power Corp. (KEP): This company is the backbone of South Korea's power grid, generating 90% of the country's total electricity. What more do I need to say? That's a very attractive position to be in! #12. Huaneng Power International (HNP): This firm supplies power to 13 of China's provinces, as well as the municipalities of Shanghai and Chongqing. Huaneng owns 16 power plants outright … has controlling interests in 10 more … and minority stakes in four operating power companies. The company is using its rising earnings to pay out a healthy dividend. #13. Mitsui & Co. (MITSY): Japan's powerhouse conglomerate has a diverse group of businesses — everything from metal products and minerals to chemicals to consumer products. Mitsui's revenues and earnings have been taking off. Bottom line: There are plenty of great opportunities overseas. And based on what I'm seeing in my travels, Asian stocks have a lot more room to run. P.S. If you want more details on some of the companies I told you about today — along with plenty of other stocks loaded with potential — just subscribe to my Real Wealth Report for just $99 a year!